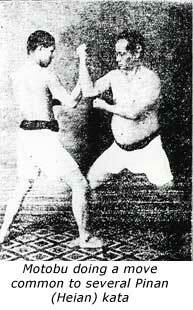 In the current issue of "Classical Fighting Arts" there is an article about this posture. The image above is from the Uechi Kyohon - however the image in the text a nearly identical illustration. The elbow "strike" being the "flag" that is raised and the other hand (that in Uechi is doing a circle) is the hand that is beating the drum. So one goes up and out and the other goes down and in. It is called the "flag and drum posture" in the text. The article is "General Chi'i and the Roots of the Channan Kata" by Henning Wittwer. Channan being a name for a group of particular Chinese forms related to the modern Okinawan series known as Heian. In the article it is stated that Itosu Tasutsune may have developed the five Heian katas based on a text of the old Channan kata. The supposed author of the text containing the Chinese forms is Ch'i Chi-kuang a general in the in 16th century. The text entitled Chi-hsiao Hsin-shu (The New Treatise on the Disciplined Service) is a manual for training soliders in various forms of combat. Chapter 14 of the text contains drawings of empty handed techniques with three basic themes a)boxing, b) wresting, and c) grappling. Now that you've got the context, back to the stance. "The Flag and Drum Position: While pushing forward left and right, give a side-wards strike with one hand when you are close, and squeeze with the other hand to throw him. The people know and benefit and for the seized head of the tiger there is no gate to flee." "If your attacker is pushing/shoving forward with both hands and you are in close, strike sideways to the outside of their arm and pull the opposite direction with your other hand to throw him. Everyone knows that where the head goes the body will follow - so that if you catch his momentum moving forward it will be very easy to throw him and very difficult for him to avoid getting thrown." So you wouldn't be using the elbow so much as a strike in this situation but as a lever/fulcrum. As you step a bit off the line of the push and drop your weight and pull with that circle blocking hand while you bury your elbow into the shover's arm you turn their linear force into a circular throw. Last edited by Dana Sheets on Thu Mar 02, 2006 4:10 pm, edited 1 time in total. Did you show compassion today? Here's a link to a forum discussing Channan, and it has links to a video of the kata. This is my first time seeing this kata but it's easy to see the Pinans in it. Thanks Mike , this is the most overdiscussed , under demonstrated kata ever !!!! Working this application yesterday it really tossed uke quickly if you grabbed the arm of the side opposite to the side you moved off the line. In the crude diagram below we have Attacker "A" with arms BC and Receiver "R" with arms ST. If Attacker "A" gives a two-handed shove at Receiver "R," R must step off the line of the attack. Let's say that R slides to the "C" side of A.
R would hit A's nearest elbow C with their T arm and seize A's B-side arm with their hand S.
This crosses A's arms - continues A's forward momentum and down they go. This would be a different off-balance/throw than the one at the open of Seiryu which only uses one arm. You can do the above movement just using one arm if that's all you end up with but they fall much harder and faster if you get the twist going. Also it ties up both of A's hands making the fall harder to receive. If R really drops hard in place (plunges in place ) into the stance instead of shoving forward this adds to how fast A accelerates into the ground. And as an added bonus - it is a pretty effortless way to defend against the common attack of a two-handed shove without actually "hitting" someone - thought you can easily soften them as they hit the ground with a good kick to the head. As a a second bonus - the posture match is perfect in application vis a vis the kata. Last edited by Dana Sheets on Thu Mar 02, 2006 7:26 pm, edited 1 time in total. Thanks for the link Mike. I didnt' really see the posture in his version of the form...but maybe I missed it? You can see another version of it from tekki shodan. here in the animated gif. Then in Channan (and the pinan) since you keep moving forward it may be nothing more than a simple block and strike. 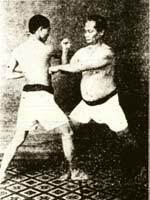 Here's Choki Motobu using the hand position in a simple but effective application. Need lots of hip twist and pay careful attention to where his foot and leg are in relation to his opponant's and how it effects the technique. The illustration I am referencing is on page 48. That's a great set of photographs in Master Uechi's Blue Book, isn't it? I'm always cool with finding new aps to old postures. For what it's worth, "Flag and Drum" posture works for me. Why? Because it intentionally does NOT try to tell you what to do with the posture. This way we can imagine many aps from one structure. And that's the way it should be, IMO. For what it's worth... The "Cobra strikes" video I recently posted on my forum was inspired by these photos from Uechi Kanei's book. The posture just spoke to me, and the subsequent mechanics became obvious (to me). But if you didn't do the "Uechi" version of "Flag and Drum" (with the hiraken), you'd never see the cobra. All you'd see is man beating drum. So your basically doing an outside armbar Dana ? , I d read it more literally as once youve jammed with the elbow you literally hook the head and twist take down , or is that what your describing ? , look at next step In seisan and see how it can resembe a neck twist . I use a Sanchin draw for the armbar sometimes , that forward projecting arm thing . It puts you in a dominant outside position , you could follow up with flag and drum easily . I see sword and sheild as a strong outside defence . It certainly fits your description as an outside opening . I`d say the footwork isnt necesaary though , to get to the outside all you have to do is shift the outside arm , not yourself or your opponent , but both methods are valid and for different folks/outcomes . Mike I find it more obvious in Tekki , the position the the rotation for maybe levering the head/neck while grabbing the arm with the drum hand . What you can do with this depends a lot on whether you approach from the inside or the outside. And truth be told, I can find all kinds of things to do with elbow movements. That would include thrusts, strikes, ukes, chokes, takedowns, joint hyperextensions, traps, etc. Tell that Bruce guy to keep working out with you, Dana. He needs to get out of the house more often. I`ll have to take a look at Sanseiryu and have a look sounds cool . Could be Marcus, but I'm starting to lean towards whatever technique is fastest for putting someone down and out. At this point I'm mostly out of the bunkai business. At least for now. What I'm trying to do now is to take what I know and generalize it so that I can use it faster. The posture just spoke to me, and the subsequent mechanics became obvious (to me). But if you didn't do the "Uechi" version of "Flag and Drum" (with the hiraken), you'd never see the cobra. Bill, In the photos from the book I saw the hiraken as hiding the elbow. And maybe a nice hiraken to the throat as he falls back after the elbow would seem a nice follow up. I agree Marcus that breaking a neck can be a very fast and effective technique, I'm just not sure that's what the move in Tekki is doing. I'm moving away from the "infinite amount of moves in each kata" school of thought as it doesn't work for me. It works for others but for me it's been more of a hinderence than a help. Right now I'm working my way through Bassai, and if I walk away with one good and usable technique from each mostly unaltered sequence that I can practice I'll be happy and I'll move on to Enpi and do the same. If somebody else wants to find the lost grappling moves then that's good too. Other than that I'm going to be taking a more generalized approach toward techniques and applications outside of kata. Sidenote: Channan is one of those kata that everybody talks about because nobody as far as I know has actually seen it. It's one of the lost ones. I've heard and can believe that the pinan were taken from Passai and Kusanku kata. the Kushanku influence is obvious , I consider that the key stone , If Channan is authentic then it too would be great . I like much of the Heians . speaking of bassai mate if you want to swap notes on the grappling thing give me a shout Ive got a lot out of it , It must be my most explored kata .